Mass Effect: Andromeda is released next week and publisher BioWare has sent out review copies to journalists. Michael Gamble, producer of the original Mass Effect trilogy and Andromeda, took to Twitter to make the announcement. "This is it. The game is in reviewers hands. In 5 years, I think we have created something magic. We humbly hope you all agree when you play." Last weekend I completed an exhaustive playthrough of the original Mass Effect trilogy, that began on 7th November AKA N7 Day last year, and the series cemented itself as one of the greatest space operas in any medium. Deftly mixing inspiration from the grand texts of Isaac Asimov to Star Wars. So, I can't wait to explore Andromeda, early, on EA Access for Xbox One from this Thursday. Many fans (myself included) will miss Commander Shepard and the fabled crew of the Normandy. 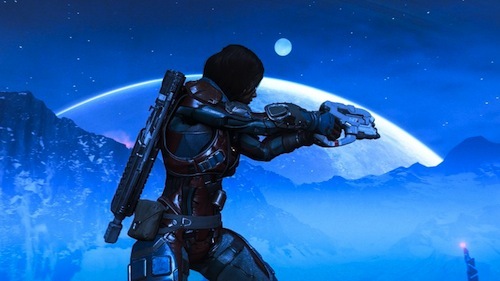 I always play as FemShep because Jennifer Hale delivers an acting tour de force imbued with pathos. Plus, on a personal note, Joker (Seth Green) is the first disabled character I've identified with in a video game. Of course empathy comes in many guises. The good news. The developer confirmed there'll be callbacks to the original trilogy. Whilst reviews are embargoed until 20th March and EA Access members are limited to 10 hours of gameplay, initial impressions of the next installment in the Mass Effect franchise will begin to filter through beforehand. Looking forward to Mass Effect: Andromeda? Let me know in the comments below.